Springtime’s approaching, the weather is getting warmer, and you’re getting ready to enjoy a summer filled with plans. The last hurdle to cross is getting your body toned back into shape, but you’re finding yourself constantly out of energy. 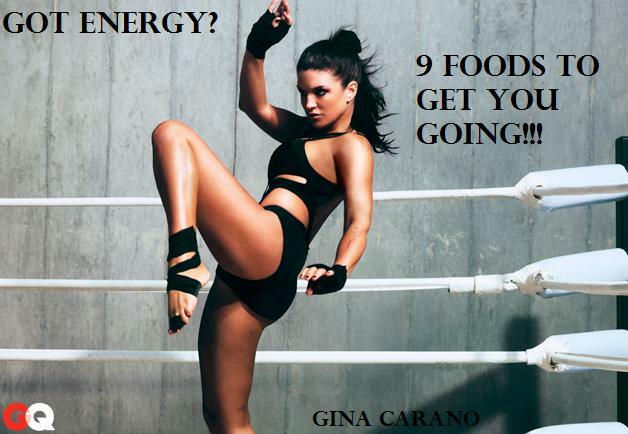 If you’ve been struggling to find energy then look no further, below are 9 foods to add into your meal plan that will get you going! Bananas is a convenient source of potassium, which helps boost energy levels by maintaining normal blood pressure and heart rhythms. Apples, People who eat two apples per day may lower their cholesterol by as much as 16 percent. According to a study of 10,000 people, those who ate the most apples had a 50 percent lower risk of developing lung cancer. French researchers found that a flavanoid called phloridzin that is found only in apples may protect post-menopausal women from osteoporosis and may also increase bone density. A Brazilian study found that women who ate three apples or pears per day lost more weight while dieting than women who did not eat fruit while dieting. Looking for something sweet and tropical? Get a taste of Pineapple. It’s easy to digest and is full of the enzyme bromelain, which aids in digestion and helps to cleanse the body. Strawberries are delicious and contain some surprising health benefits as well! Strawberries are packed full of biotin (which helps support your skin, hair and nails)! Celery is labeled as a miracle food. Quick and easy to digest and chock full of fiber and vitamins B and C, it also helps to balance potassium and sodium levels while reducing inflammation in the body. Yogurt is known as a quick energy booster which contains a combination of calcium, magnesium and proteins. Yogurt also supplies the brain with tyrosine, an amino acid that boosts blood levels of the neurotransmitters dopamine and norepinephrine, resulting in a mood and mental boost. The fiber in Oats lowers total cholesterol and LDL cholesterol, or the bad type of cholesterol. With every 1 percent reduction in LDL cholesterol, heart-disease risk is lowered 1 to 3 percent. Spinach should be part of your diet. It’s low in calories and high in nutrients. Research has shown that spinach aids in the prevention of age-related macular degeneration, cataracts, some cancers and cardiovascular disease. Dark chocolate is a potent antioxidant and can help reduce blood pressure. The potentially bad news: You should still keep your daily chocolate intake low, due to the fat and calories.